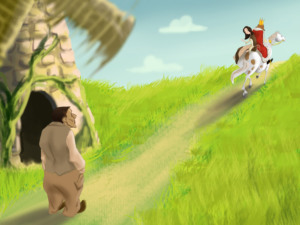 A long, long time ago in a faraway land there was poor miller who wanted to get rich, so he told the king that his daughter could spin straw into gold. 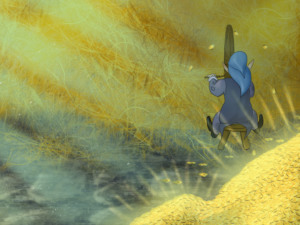 Left alone in the locked room in the tower, the miller’s daughter started crying, because she didn’t know how to turn all that straw into gold. Suddenly an imp appeared out of nowhere. “I can help you turn the straw into gold, but you should give me your gold necklace in exchange”, he said. She agreed. The next day the king came in. He was astonished! He saw that the straw was gone and now the room was filled with gold. “Put her in a bigger room with more straw tonight. 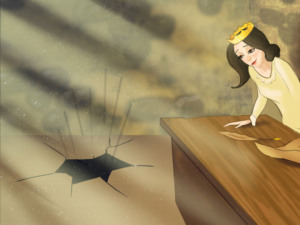 If she turns it into gold, I will free her”, the king ordered. 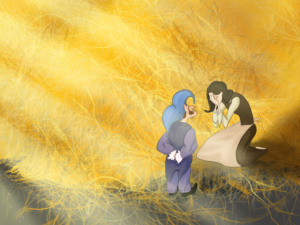 That night the imp appeared again and offered to help her, but this time he asked for her ring. 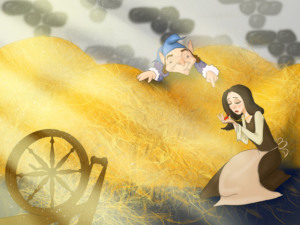 By the morning the straw had been turned into gold and the imp had disappeared into thin air. 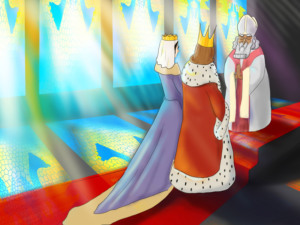 Once again, the king was astonished by the miller’s daughter. “Put her in a bigger room with even more straw. 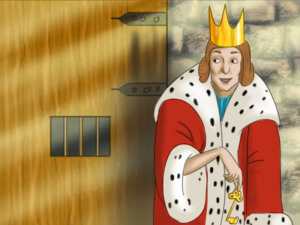 If she spins that straw into gold again, I will marry her and make her my Queen,” said the king. Night came and the imp appeared again. “I have nothing left to give you”, the girl said. 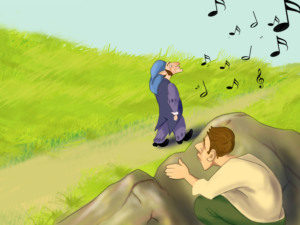 You can promise me that you will give me your firstborn child in exchange for my help,” the imp answered. The girl had no choice. She couldn’t do anything with the straw. “Alright, I will give you my first child”, the girl promised. And just as the night before, the imp turned the straw into gold and then disappeared. 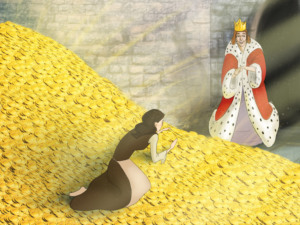 The next morning, when he entered the room the king was amazed - it was filled with gold again! He kept his promise, because he thought that the miller’s daughter could make him rich. They got married and soon the queen gave birth to a child. 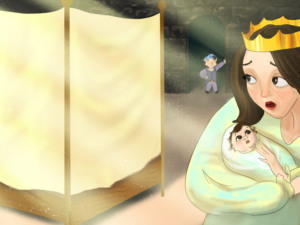 When the imp came to ask for the child, she got scared that the king would lock her in the tower. 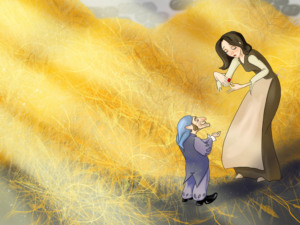 “I will give you as much gold as you wish, just don’t take my child,” she begged. “I have no interest in your gold. But I will let you keep your child if you guess my name within three days”, he answered. The queen agreed. Two days passed and she kept listing names unsuccessfully, “William, Oliver, Peter, George, Harry, Nathan, Ben, Charles, Alexander, Daniel, Max…”, but the imp kept saying “No” to all her guesses. 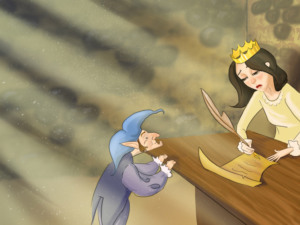 The next day the imp returned to the palace and the queen kept listing names as if she didn’t know “Geoffrey, Robert, Luke, Felix, Oscar, Douglas…” until she finally listed “Rumpelstiltskin”. The imp got so angry. In a flash he stomped his left foot in the ground so hard that a big hole opened and he disappeared into it forever.